In the bowl of a food processor, place all the ingredients except the Olio Sundried Tomato Parmesan Garlic Olive Oil. Blend well. Slowly drizzle in the Olio Sundried Tomato Parmesan Garlic Olive Oil through the feeding tube, until the desired consistency. It will be somewhat chunky. (Do not make too thin if spreading on a crostini). Spread each baguette slice with pesto. Serve. 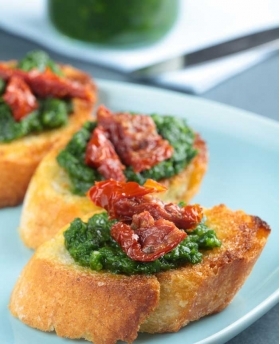 For a little extra flare, spread crostini with a little softened goat cheese before adding the pesto.